The “System Configuration” page is where most system-global settings can be viewed and configured in GreenArrow Studio. Settings can be viewed by navigating to “Admin” => “System”, and edited by then clicking on one of the “Edit system configuration” buttons. The rest of this page describes the system configuration options that are available to you, broken up by section. The currently installed GreenArrow Studio version. See the changelog for details on when your version was intially released, what the latest version is, and what’s changed. The total number of credits used by your GreenArrow installation. See your GreenArrow license agreement or contact your account manager for details. The maximum number of processes that a single Special Sending Rule execution may use. Increasing this may allow Special Sending Rules to run faster, but requires additional CPU resources. The maximum image size that any user may upload for use in campaigns — kB/MB suffixes are allowed. The maximum attachment size — kB/MB suffixes are allowed. The maximum total size of all attachments within an mail — kB/MB suffixes are allowed. If you specify a value, then GreenArrow will start including an X-Mailer header in each email with the specified value. The header is ommitted by default. These extra (X-) headers will be included with all emails sent from GreenArrow Studio. Specify one header per line. Use this option to require the inclusion of unsubscribe links in campaign content. Campaigns that are already scheduled when this option is turned on will be unaffected. See the Automatic Suppression Lists page. See the Data Retention page. These settings control how and whether GreenArrow Studio throttles its sends when it runs low on disk space. This feature monitors the partition which contains GreenArrow’s disk-queue (/var/hvmail/qmail-disk/queue/). If other partition(s) run low on space, then this feature will not automatically be engaged. These settings do not apply to autoresponders. Used to turn this feature on and off. Start throttling the campaign sending speed if available disk space drops below this amount. The initial throttling speed is 1 million messages per hour, per campaign, unless some other limitation, such as campaign sending speed specifies a lower number. As more disk space is used, the campaign sending speed will progressively decrease. Fully engage throttling if available disk space drops below this amount. This means that only 60 messages per hour, per campaign will be sent out. Send email notification to all system administrator users when throttling is engaged. Additional email addresses to notify when throttling is engaged. The amount of space that’s currently free. Indicates whether throttling is engaged. Inbox stats provided a report on what portion of the campaign’s email went to the Inbox vs. Spam folder vs. neither location. This data is generated whenever a campaign is sent to the GreenArrow Monitor seed list. SMTP stats provide detailed statistics on what happened at delivery time. These include the deferral and throttle rate. See the Default Headers and Footers page. There are options for monitoring the content being sent from GreenArrow Studio. Adding an email address to this field will cause all subscription email confirmation messages to be sent with a BCC to the specified address. 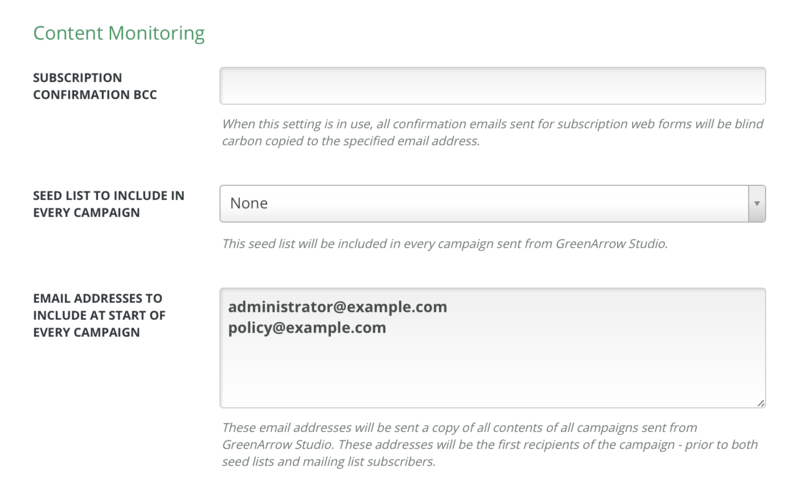 Selecting a seed list here will cause that seed list to be included in every campaign sent from GreenArrow Studio. It will be treated just the same as any other seed list, with the seed addresses interleaved throughout the campaign delivery. These email addresses will be delivered a copy of the campaign prior to any other deliveries. If the campaign has multiple contents, all contents will be sent to all addresses in this list. In the example above, 123 is the organization ID and 456 is the campaign ID. Once the messages to these addresses have been injected, normal delivery will proceed to mailing list subscribers and seed email addresses. If the campaign uses a special sending rule, the recipient will appear as a seed address - with an id in the form of seed-MD5 where MD5 is the lowercase MD5 of the recipient’s email address.